The top U.S. Army commander in Europe says Russia has substantially increased its support for separatists in eastern Ukraine since a ceasefire agreement was reached last September, the Hill reports. "When you look at the amount of Russian equipment that the proxies were using prior to the Minsk agreements, that amount has doubled beginning in December into the hundreds," he told reporters on his first visit to Ukraine as U.S. Army Europe commander. Hodges said Russia was sending surveillance drones to the rebels to help provide intelligence, as well as artillery. "Those are not the types of things you would find in a militia. 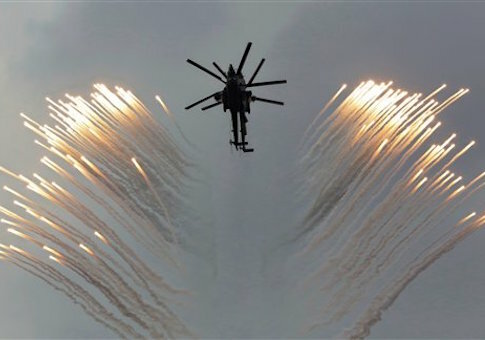 They clearly are coming from a modern military force coming from Russia," he said. Ukrainian President Petro Poroshenko also accused Russia on Wednesday of sending 9,000 troops to support the rebels inside Ukraine, according to Reuters. The White House has so far declined to meet Poroshenko’s request for lethal aid to battle the separatists. The Ukranian government acknowledged on Thursday that it had surrendered the Donetsk airport—a scene of heavy fighting in recent months—to the rebels. This entry was posted in National Security and tagged Russia, Ukraine. Bookmark the permalink.